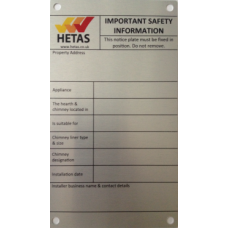 HETAS branded metal Notice Plates. Available in 'Screw Holed' or 'Sticky Backed' options. Please note the screw holed products are supplied with a protective plastic film which must be removed before you write on them. Sharpie Twin tip pens are also available to use with our Notice Plates. Click here to view the pens. For a small admin fee HETAS can produce bespoke notice plates for your business. Email shop@hetas.co.uk for details.